Emmanuel Ogude netted five goals for Vendsyssel in their 9-1 annihilation of Egen in the second round of the DBU Pokalen on Wednesday evening. The 24-year-old would have scored a few more goals but was a little wasteful in front of goal and missed a penalty in the fifteenth minute. Ogude netted in the 8th minute to give Vendsyssel a 2-0 lead, made it 3-1 in the 31st minute and grabbed his hat-trick with 11 minutes still to be played in the first half, before scoring his fourth in the 36th minute. After the intermission, the Nigerian striker gave the Superligaen side a six-goal cushion by scoring his fifth goal in the 57th minute. Prior to yesterday's meeting at Guderup Idrætsanlæg (Nordborg), Ogude had registered his name on the score-sheet once, in a league game against Bröndby IF on August 26. 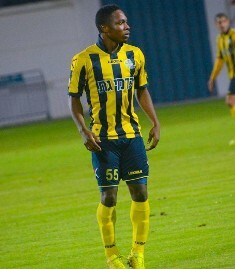 He played for Hapoel Ashkelon, Maccabi Kiryat Gat, Maccabi Petah Tikva and Boldklubben af 1893 before joining Vendsyssel in the summer of 2017.